Iowa’s top public safety official and the chief of the Iowa State Patrol will both be retiring next month. Roxann Ryan and Jeff Ritzman will be stepping down on January 2, both ending careers of 36 years in public service. Ryan has served as Commissioner of the Department of Public Safety the past four years after joining the agency in 2006. 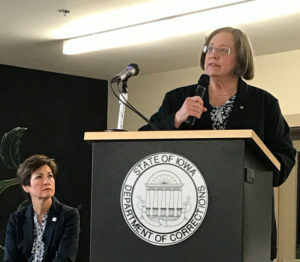 She previously worked in the Iowa Attorney General’s Office for 24 years. Ritzman was named the 16th Chief of the Iowa State Patrol just last year. The Dubuque native started his career with the Patrol in 1982. A news release announcing Ryan and Ritzman’s retirements does not mention their successors.